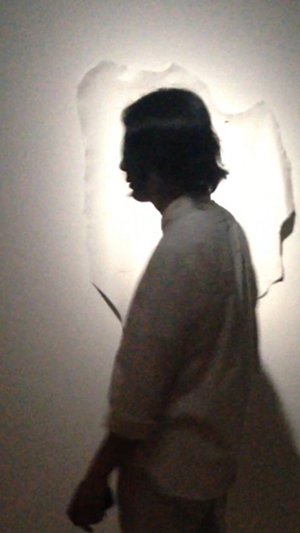 koeosaeme is Ryu Yoshizawa’s experimental AV performance & sound art project. The project pursues the fusion of program art and sound art through openFrameworks. From 2004, the artist has been affiliated with the sound creator group “OFFICE INTENZIO” under YMO’s Yukihiro Takahashi. In addition, up until now, the artist has been in charge of live event backup support, recording, and manipulation for various people and events such as SKETCHSHOW, Ryuichi Sakamoto, Yukihiro Takahashi, Jazztronik, kyoka (raster-noton/onpa) “ufunfunfufu”, and Nobuko Hori “xtoyourmilkyhair”. Moreover, the artist has also done music production for image DVDs and TV commercials for companies such as Lotte and Square Enix. In 2009, the artist’s work known as “zoo” was nominated at the J-WAVE radioSAKAMOTO Audition Corner and was highly praised by Ryuichi Sakamoto. In 2014, the artist began working under the name koeosaeme. The artist then performed at the RED BULL MUSIC ACADEMY’s “Lost in Karaoke” as the experimental DJ unit known as “Absolutely Amateur”. In 2015, the artist released EP “crypto” under Denryoku Label (JP). The artwork was provided by Nobuko Hori, who has worked on promotional videos for artists such as Shugo Tokumaru, Midori Hirano, and Christopher Willits. In addition, the artist participated in kaleidosoup (audio and visual performers’ festival) in Ho Chi Minh City (Vietnam) and received a lot of positive feedback.